Our dollies are designed to facilitate the safe and easy movement of crate stacks. 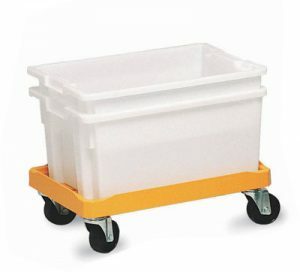 We have a wide range of dollies with a variety of base versions, to suit the varying dimension of our containers. All our dollies are lightweight, hygienic and are suitable for use in cold stores and freezers. They are available in a range of materials, with different wheels and castors to suit many applications.